Employee engagement is an important factor in any office, regardless of size. While few companies seem to have gotten it right, it still remains true that the majority of American workers are disengaged. This leads to low motivation, poor productivity, and lower performance levels. That's where Officevibe comes in. Officevibe provides companies with team building activities with the purpose of boosting employee engagement. Employees are sent on "missions" (such as praising a coworker, going to the gym, using a standing desk, or bringing a meal from home), and upon completion they receive points in one of five categories: wellness, productivity, social, environment and generosity. The idea is certainly novel and entrepreneurs, especially those with tight deadlines and are always pressed for time, can definitely make use of Officevibe's service. Plus, the gamification aspect makes it fun and appealing for employees. I recently spoke with Jeff Fermin, the co-founder of Officevibe about the services his company provides and what leaders can get out of it. 1. Can you tell us a bit more about Officevibe's services? Sure thing, Officevibe is a unique employee engagement solution that encourages more office collaboration and daily team building. In essence, it’s a social platform that encourages people to interact with one another and work together for work-related subjects, along with non-work related activities. 2. 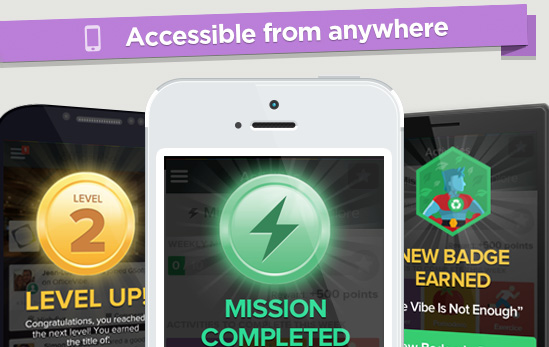 Are the "missions" designed by the companies that use the app or by Officevibe? What are some examples of these missions? 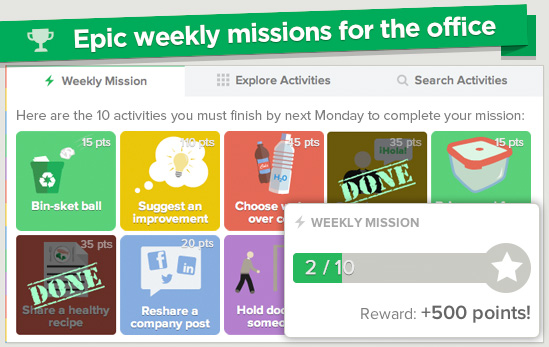 The missions are one of the neat features that we came up with here at Officevibe. We wanted our users to be driven to try new things that would make their office better. We have over 250 pre-generated team building activities that people can do regularly. We wanted to add an extra fun factor with missions and have them try new activities that they wouldn’t normally do, all the while, making themselves and the office better. The companies can design the mission if they are a premium account (among many customization features). I’ve seen wellness initiatives, green initiatives, etc., and it has improved the overall “vibe” at the office. 3. How can employee engagement boost productivity? Well, when you have employees that are engaged within your office it creates a creative and productive atmosphere. When employees are engaged, it means that they believe in the mission of the company and they will go all out and make sure that the company is up to its standard and make it even better. There’s a reason why people that work for some of the “best places to work” love their company, and it’s because they are engaged and they absolutely believe in everything that their company stands for. 4. The Officevibe websites says there are five factors to employee engagement: wellness, productivity, social, environment and generosity. How do each of these categories contribute to a great working environment? When we started off, we did a lot of research on major companies from across the globe. When we compiled all the articles, data, and research, we found that all of the top companies focus on those five things. They do their best to keep employees healthy, have a “green” office, create a social atmosphere, they encouraged generosity through philanthropy and volunteer work, and they made sure they cater to their employee’s needs to make them productive. There are hundreds of articles written on the effects of how one of the big five would help create more productive and creative atmospheres, so with that we wanted to create an all-in-one platform, that can help all those facets of a company and create a great work environment. 5. Gamification is a great motivational tool being used by many workplaces. How has Officevibe used this method to encourage engagement, team building and overall productivity? Yes, gamification is an absolutely wonderful motivational tool. So we wanted to gamify the officevibe experience so that people would be able to feel that extra intrinsic motivation when they completed a task. When people complete their tasks, they have the opportunity to earn points, badges, achievements, and really earn that status as an officevibe leader. When they earn that status or they do the suggested activities, they’re contributing to creating a better work environment and they are becoming better individuals as well. Outside of that, it really adds an extra “wow” factor to the product. We are very design-centered, so we’re able to come up with all sorts of cool animations and present the product in such a way that it will motivate and encourage people to do better.